UPDATE: Since the publication of this report on September 19, 2017, additional analysis of state records shows that between 2012 and 2016, almost three-fourths of 1- and 2-year-olds enrolled in the state-run low-income health insurance program were not tested for lead in their blood. Despite federal and state laws requiring blood tests for all young children most at risk for lead poisoning, year after year California falls far short of its responsibility. An EWG investigation found that in 2013, the latest year for which detailed records are available, an estimated one-third of high-risk 1- and 2-year-olds were not tested. This adds up to 160,000 children whose brains could be permanently damaged by a poison for which there is no level of safe exposure. State regulations mandate that all children enrolled in Medi-Cal or other public assistance programs should be tested at 12 months of age and again at 24 months to see if intervention is needed to protect against further exposure. Lead poisoning can threaten children of any socioeconomic status, but those from lower-income families are more likely to live in older housing with lead paint or face exposure from other sources. But the state and almost all of its 58 counties have failed to meet this mandate for decades. The state Department of Public Health has the ultimate responsibility for ensuring lead testing, but the obligation is shared by counties, most of which run their own childhood lead poisoning prevention programs, funded by state grants from fees paid by lead polluters. Statewide, 34 percent of 1- and 2-year-olds on Medi-Cal were not tested. 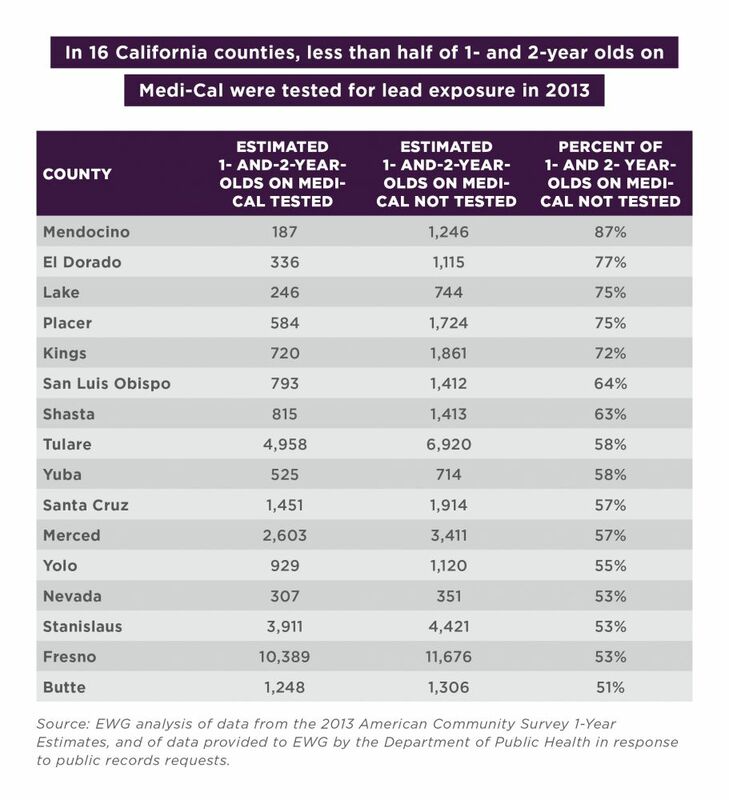 In 16 counties, more than half of the young children on Medi-Cal were not tested. Mendocino County missed 87 percent; and El Dorado, Lake, Placer and Kings counties each missed at least 70 percent. The largest-population county in that category was Fresno, where 53 percent were not tested. In 18 rural counties for which detailed data is lacking, an estimated 46 percent of 1- and 2-year-olds on Medi-Cal were not tested. 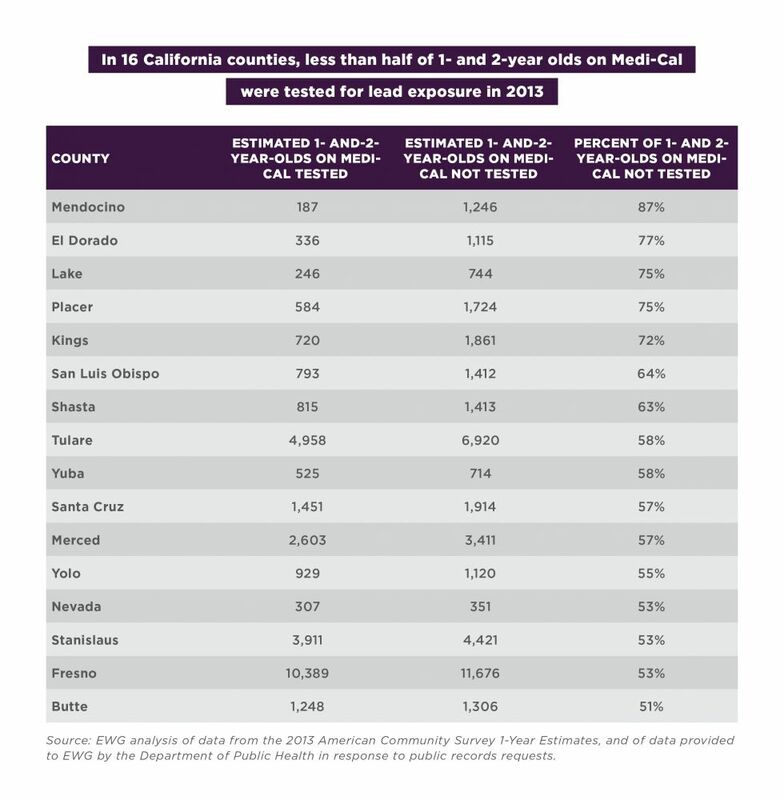 In 14 other counties – including more affluent counties, such as Los Angeles, Santa Barbara, Marin and Sacramento – 30 to 48 percent of young children on Medi-Cal were not tested. In eight counties, at least three-fourths of young children on Medi-Cal were tested. San Francisco actually tested 841 more kids than the number of 1- and 2-year-olds enrolled in Medi-Cal in the county. Complete lead testing results for all 58 counties. In 1990, child and environmental health advocates filed a lawsuit against the state for failing to guarantee that Medi-Cal-insured children were tested for lead exposure as required by federal law. In a 1991 settlement agreement, the state agreed to require testing for all young children enrolled in Medi-Cal and to report lead testing data. Federal regulations now require lead testing at 12 and 24 months for kids on Medicaid, which in California is called Medi-Cal. State regulations also impose this requirement and expand it to apply to children receiving other public assistance benefits. In addition, the state requires testing of all other children who spend a lot of time in poorly maintained or recently remodeled buildings built before 1978, and a state guideline asks medical care providers to test children who might be exposed to lead from other sources, such as candy, toys or contaminated soil, or when a parent requests a test. After the settlement, the legislature provided the Department of Health Services – now known as the Department of Public Health, or DPH – broad regulatory authority to ensure that all children are evaluated for lead exposure and that lead-poisoned children are helped. The legislature also directed the department to create lead testing protocols and created a fee to fund the program. But despite being given both the legal and financial means to tackle the problem, the DPH has repeatedly failed to meet its charge. The following year, an EWG investigation found that between 1992 and 1998 the state failed to identify, test or provide care to an estimated 200,000 lead-poisoned children ages 1 to 5. Our current analysis of 2013 data – covering a single year and a smaller age range – suggests little or no improvement. According to the DPH, the number of lead tests reported to the state declined slightly between 2013 and 2016. But the population of low-income children increased, so the current statewide testing rate may be worse than our estimate of 34 percent. A remarkable flaw in the DPH’s tracking system is that the department does not know how many children who get tested are enrolled in Medi-Cal. As a proxy, we compared the number of tests to Census data of California children enrolled in publicly funded health insurance, most likely Medi-Cal. (For a detailed discussion of how we reached our estimates, see the methodology section. Who is responsible for testing kids? The state funds the Childhood Lead Poisoning Prevention Program through fees paid by lead polluters. This fee covers the department’s costs to run the program, and provide services and treatment to children who are lead-exposed or poisoned. The fund is projected to have a surplus of $50 million by the end of fiscal year 2017-2018, but annual expenditures currently exceed fees paid by $14 million, so a recent analysis by the state Senate Appropriations Committee said the rate assessed to polluters will need to be raised in a few years to avoid cuts to the program’s budget. The fee also pays for local prevention efforts. The department contracts with 40 of the 58 counties, and three cities – Berkeley, Long Beach and Pasadena – to provide referrals for testing to health care providers and lead poisoning case management, as well as environmental assessments and public and provider education. In fiscal year 2012-2013, these local programs received state grants totaling more than $13 million. Doctors and other health care providers are also responsible for testing children on Medi-Cal during checkups. Parents can ask providers to order a test for their child, and the state recommends – but does not require – that providers do so. Public and private health insurance must cover the cost of the test. A recent report by the California Environmental Health Tracking Program, a partnership between the DPH and the Oakland-based Public Health Institute, said providers need to take lead poisoning more seriously and test more children. But efforts to enact laws that would have caused doctors to test more at-risk children have been stymied by opposition from the medical community. The Department of Public Health must step up and meet its responsibility under federal and state law to see that all children at risk for lead exposure get required blood tests. This responsibility is shared with counties, but the differences in testing rates around the state suggest the DPH is not proactively overseeing contract counties’ programs or effectively directing efforts to test more kids. Strengthening oversight of counties’ prevention and treatment services. Counties must also improve their performance. EWG’s analysis shows that some counties are much more successful at ensuring that kids are tested than others. For example, in Imperial County, about three-fourths of young children on Medi-Cal were tested in 2013. In the same year in Madera County, which has roughly the same population, median household income and number of kids on Medi-Cal, only about half of the children were tested. Even more affluent families should have their children tested for lead if they could be exposed to lead in paint, drinking water or any other sources. State guidelines recommend that doctors order a test anytime a parent requests one, and insurance policies must cover the procedure. Most blood lead tests can be done in a doctor’s office with a simple pin prick. Doctors and other health care providers must more diligently assess kids for potential lead exposure and test those they believe could be at risk. Many of these issues are addressed by Assembly Bill 1316, which unanimously passed both houses of the legislature this month. The bill, by Assembly Members Bill Quirk, D-Hayward, and Cristina Garcia, D-Bell Gardens, and sponsored by EWG, requires the DPH to update standards doctors must follow in deciding whom to test. In revising these standards, the department must consider the different ways in which children might encounter lead, such as living near an old lead smelter or other industrial facility. The bill also directs the department to provide more information to the public about the prevalence of childhood lead exposure. For details on how EWG conducted this analysis, see Methodology. Olga Naidenko, Senior Science Advisor for Children’s Environmental Health and Sonya Lunder, Senior Analyst, also contributed to this report. Stipulation for Settlement and Dismissal Without Prejudice, Matthews v. Coye, No. C-90-3620-EFL (N.D. Cal. Oct. 17, 1991). California Lead Poisoning Prevention Program, communication with EWG in response to Public Records Requests. May to August 2017.